Execute sets of scripts, or batches, across multiple destination environments. With each targeted batch, confirm a specific set of functionality, across one or more environment configurations. Create and execute a library of batch scripts, targeting portions of the application under test (AUT), or the entire AUT. Quickly validate batch results from the comprehensive report, summarizing the testing success as well as identifying and detailing any regressions. Execute sets of scripts or batches. Group related tests or dependencies into a single execution. Automate batch distribution to multiple destination environments. Validate requirements with requirement use case batches. 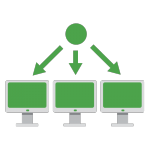 Confirm key functionality across each supported environment configuration. Determine product readiness using the comprehensive batch reporting. Exercise targeted functionality with feature-specific batches. Regression test more in less time, unmanned, and against multiple environments.